Carnival Miracle is a ship you may not believe when you see but definitely don’t miss seeing this one! When we say that Carnival Miracle takes you to another world, we mean that in every sense. Not only does this ship visit stunning destinations, but features incredible onboard spaces inspired by elements of fantasy. Escape from reality as you take in a show at the Phantom Lounge, a drink at Odyssey Bar or a dance at Dr. Frankensteins Lab. To lose yourself in a song, find your way to Sams Piano Bar. Hungry? You will find great food all over the place, from the casual fare of Horatios, to the artful eats of the Bacchus and Ariadne dining rooms not to mention the world-class cuts at Nick & Noras Steakhouse. At Alchemy Bar we make drinks into art, while the laid-back RedFrog Pub has ‘Caribbean cool’ down to a science. And up in SkyBox Sports Bar, we’ve combined luxury-box comfort with the very down-to-earth view from the 50-yard line. Outdoors, there’s fun to be had, whether youre down for watersliding or up for simply sunning – Carnival’s Twister Waterslide has you covered (in water, that is), and the Serenity Adult-Only Area will get you relaxing, grown-up-style. No matter your age, lifelong childhood-faves come to life, on-stage, at Hasbro, The Game Show. We’ve also got the interactive CLUE: The Murder Mystery woven dramatically throughout your entire voyage. And in case you forget, don’t forget: the sweetest way to cap off the day is with a treat from Cherry On Top, our onboard candy-and-more store. 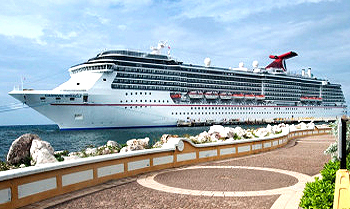 View all Carnival Miracle cruises or view more options for Carnival cruises. Enjoy ice-cold refreshments during meals, during shows, during, well… anytime you want with Bottomless Bubbles. This unlimited soda program lets you indulge in all-you-can-drink soda and juice for the full length of your cruise. Sweet! Bottomless Bubbles is available for purchase at the Lobby, Casino and Pool Bars. Note: Bottomless Bubbles is not applicable to Room Service purchases, and can only be purchased for the entire length of your cruise. Treat your taste buds to the experience of a lifetime, culminating in a sumptuous multicourse dinner hosted by one of our master chefs. Your VIP experience starts with cocktails and hors d oeuvres for a select group of 14, followed by a tour to see the galley in operation. The evening concludes with a mind-blowing full-service dinner of amazing appetizers, entrees and desserts not found on our regular dining menus. Tip: Reserve early because this once-in-a-lifetime experience has limited seating. Reservations can be made at the ships Guest Services desk. or make your own mix swirled as high as you can balance it. Open on Lido deck 24/7, our frozen yogurt and soft-serve ice cream is a great way to beat the heat all day, or the perfect nightcap after a long evening of fun. Give the forks and knives a break and grab some chopsticks as you enjoy this bold and flavorful Chinese culinary experience. Help yourself to delicious dishes like sliced beef honey chili, five spice and oyster glazed seafood, pork or chicken cellophane noodles, shrimp fried rice and so much more – served with crispy vegetable rolls. The food at Chopsticks is so flavorful, you probably won’t want to share. Take a scroll from our various nightclubs to the fun seeking show lounges enjoying Carnival’s nightlife. This “Fun Ship” is fully equipped with a variety of entertainment of choice. You can choose to be dazzled by our one of a kind Las Vegas-Style Shows and even enjoy our live entertainment that suites all preferences. Comedy clubs on land… well, it’s kinda funny. Nobody likes paying cover charges, and you know that two-drink minimum? They’ve gotta be joking! You won’t find either of these at The Punchliner Comedy Club aboard your Carnival cruise. Up on stage you will find some real pros who know how to wedge a little laughter into anyone’s evening. You can count on these comedians to not hold back either. Since some of them get up and say exactly whats on their mind, we also schedule family-friendly performances… so the only red faces in the audience are from laughing a little too hard. When families cruise Carnival, even the smallest fish in the pond have a big, awesome time. Okay, so it’s actually way more than just a pond – it’s Camp Ocean. At Camp Ocean, 2-11 year-olds stay busy, keep active and have fun as they enjoy all new ocean-themed activities and entertainment made for kids. We put campers into supervised, age-based groups and give each a cool marine-life label that’s sure to raise the sails on camaraderie at sea. The littlest little ones – ages 2 to 5 -join the Penguin colony and engage in activities like Musical Icebergs and Ocean Bingo even learning a thing or two about buoyancy! The little-biggers, 6 to 8, are the way-cool Stingrays, who might be found enjoying Pirate Game Night, making sea salt art or even designing their own aquarium. The big fish are the Sharks – ages 9 to 11 – who really sink their teeth into playing Marine Life Trivia, creating a giant ocean mural, and scoring big with games and sports competitions. Our counselors, each with education or childcare experience, are there to make sure everyone in these small groups has an amazing time. From finger painting to cartoon time, the little ones will also have a blast at Carnival Miracle’s supervised camp for kids 2-11. One of the coolest spots on Carnival Miracle is Circle “C” and it’s just for kids 12-14… Video games, dance parties, late night movies, Karaoke and more. What could be funner? The place to be aboard Carnival Miracle for teens 15-17 – They can enjoy their own cool parties, movies and shore excursions. Feel the stress sail away as you pamper yourself with soothing treatments and massages for your body and soul at Carnival Miracle’s Spa Carnival…Ahhhhh. Slide and glide on Carnival Miracle’s fun-ified Twister Waterslide. It’s three decks high of twisting and turning water mania – Perfect for splishin’, splashin’ and playin’ at any age. Horatio’s (Carnival Miracle Lido restaurant) – Stroll around the buffet and explore our many international cuisines and made-to-order options. Choose Early (6 p.m.), Late (8:15 p.m.) or Your Time (5:45 p.m. to 9:30 p.m.) dining in the Carnival Miracle Bacchus Dining Room and feast on culinary pleasures to your heart’s delight. The intimate ambiance and mouth-watering favorites at the Carnival Miracle Nick & Nora’s Steakhouse will make this a truly memorable meal. Maguire’s Bar (Carnival Miracle sports bar) – Cheer your home team to victory or just catch up with friends. Mr. Lucky’s (Carnival Miracle casino) – Is there a more exciting sound than the ka-ching of the casino?… Turns out “Lady Luck” likes to cruise as well. Phantom (main show lounge) – Sit back and enjoy the performance, where every night is aboard Carnival Miracle an extravaganza. Mad Hatter’s Ball (Carnival Miracle lounge) – Be courageous with Karaoke or just be entertained by the hilarious comedians. Sam’s (piano bar) – Join your fellow guests around the Carnival Miracle piano bar and sing along to your favorite songs. What’s a cruise without water? Siren’s (Carnival Miracle Pool Area) – Take a swim or just relax poolside – whatever floats your boat. Fall in love with your suite. It’s packed with plush carpet and swanky decor. And sleep like a baby on your Carnival Miracle Comfort Bed.